If you want your workouts to result in the visible change of your looks then pushing it to the limit and further must become an inherent part of your muscle-building exercises. At the same time doing it without any damage to health is equally important. 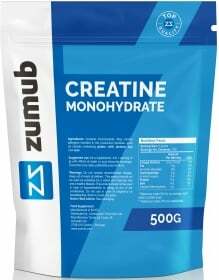 Zumub’s Creatine Monohydrate Powder can ensure that the bulking up process will be both safe and efficient. Highly intensive workouts naturally require huge energy loads most of which are derived from Adenosine triphosphate (ATP) depletion the most vital element in the energy producing process. Creatine is responsible for restoring ATP levels. In other words, creatine will promote your body’s endurance and strength by giving it the energy it needs in order not to pump the brakes on the way to the ultimately effective workout. Creatine is also able to influence lean muscle mass growth and muscles volumization. The effect is achieved by enlarging the amount of water muscles contain and by stimulating the production of additional muscle fibres. So, you can enjoy both far reaching and quick results. 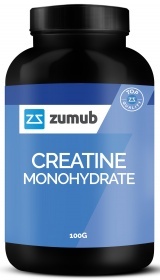 Zumub’s Creatine Monohydrate Powder - a pearl your pre or post-workout shake lacked to be perfect. Other Ingredients: 100% Creatine Monohydrate. Add one and a half medium scoops (5g) to 100ml of water. We recommend 5g daily, best taken with your pre or post-workout shake. WARNINGS Creatine : Do not exceed recommended dosage. Keep out of reach of children. Do not use if you are hypersensitive to any of the constituents of the preparation. Store tightly closed in a cool, dry place. Food supplements should not be used as a substitute for a varied and balanced diet and healthy lifestyle. BEST BEFORE: Please see lot number and expiration date stamped on the packaging.